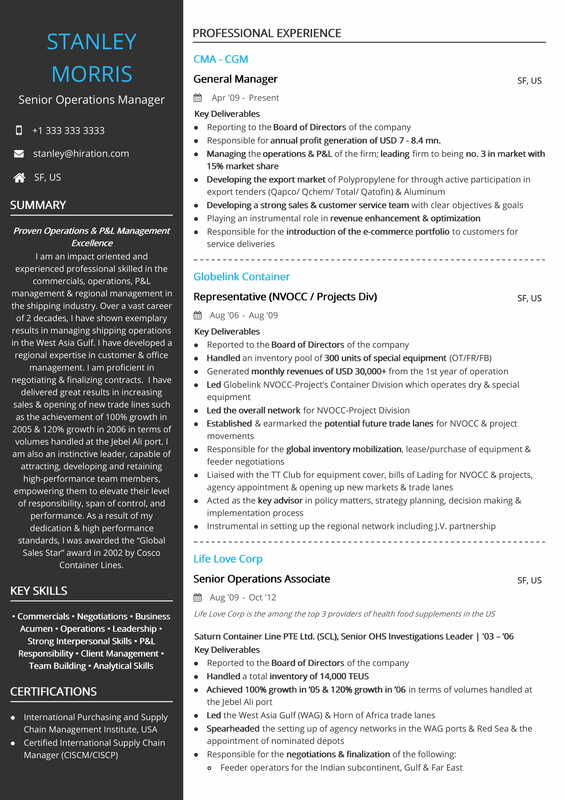 For the Supply Chain Manager resume example, here is the profile of Dwayne Johnson, who is a 7+ yr. experienced supply chain professional. 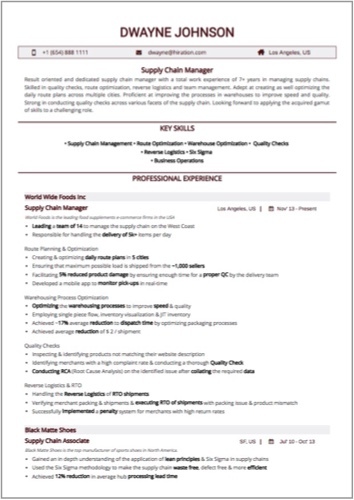 This Supply Chain Manager resume sample demonstrates multiple skill sets including route optimization, warehouse optimization, quality checks etc. For the Operations Manager resume example, here is the profile of Vito Corleone, who is an 8+ yr. experienced operations professional. 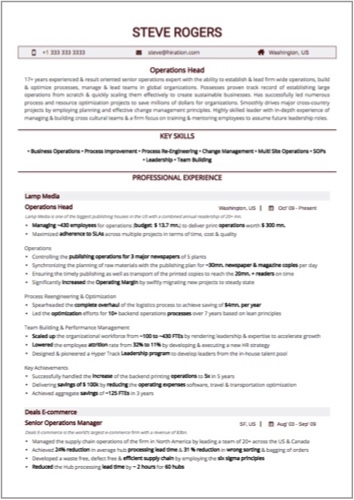 This Operations Manager resume sample demonstrates multiple skill sets including business operations, process improvement, team management etc. For the Operations Head resume example, here is the profile of Steve Rogers, who is a 17+ yr. experienced operations professional. 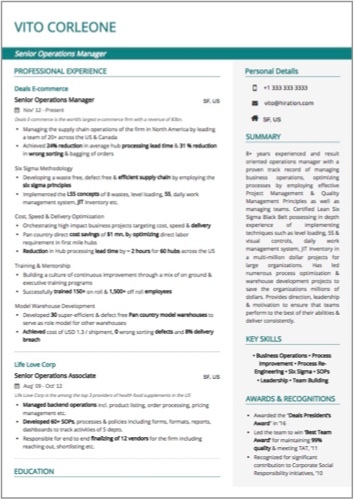 This Operations Head resume sample demonstrates multiple skill sets including business operations, change management, leadership etc. For the Operations Associate resume example, here is the profile of Neville Longbottom, who is a 3+ yr. experienced operations professional. 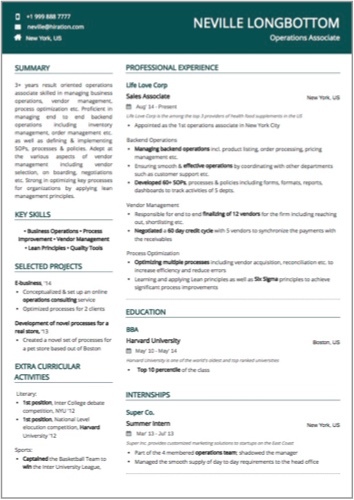 This Operations Associate resume sample demonstrates multiple skill sets including operations, vendor management, lean principles etc. For the Key Account Manager resume example, here is the profile of Patrick Karev, who is 9+ years experienced Key Client Manager. 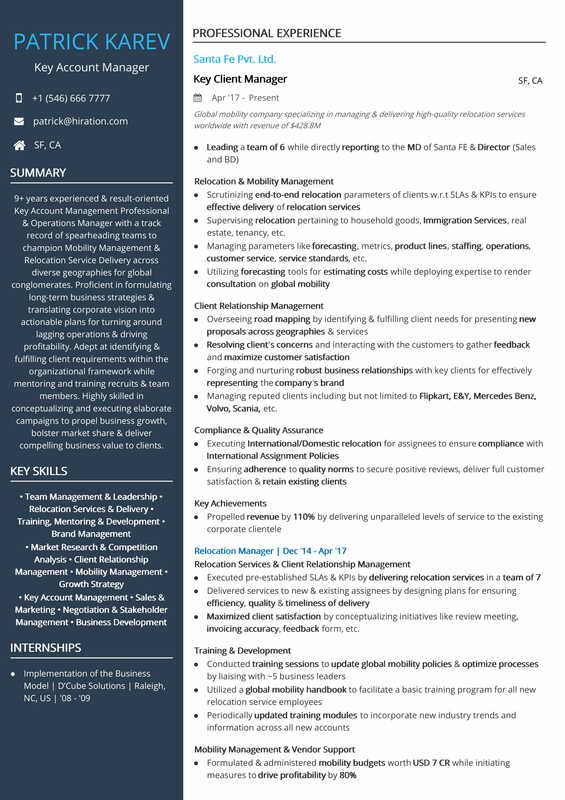 This Key Account Manager resume sample demonstrates multiple skill sets including client relationship management, mobility management, compliance, QA, etc. For the Marine Operations Leader resume example, here is the profile of Steve Woods, who is 20+ years experienced Chief General Manager. 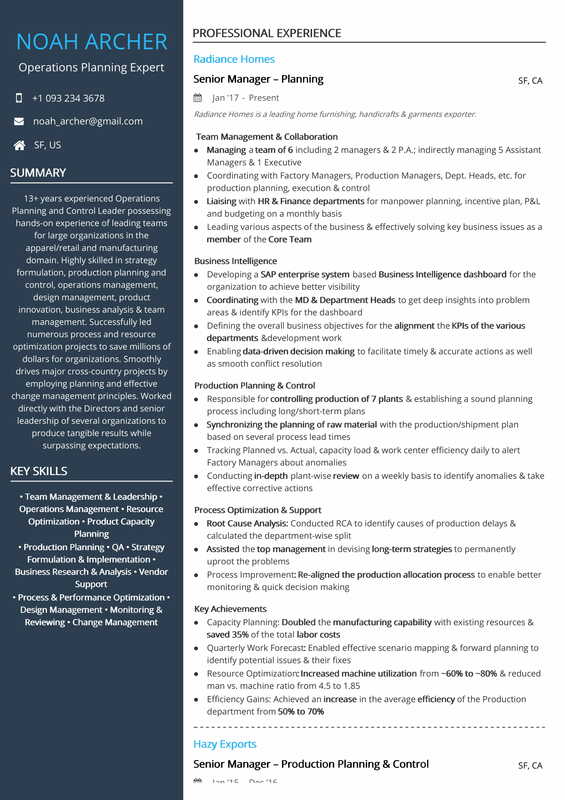 This Marine Operations Leader resume sample demonstrates multiple skill sets including asset management, compliance, process excellence, cost control, etc. For the Hospitality Operations Expert resume sample, here is the profile of Steve Rogers, who is 12+ years experienced General Manager. 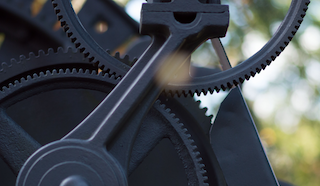 This Hospitality Operations Manager resume sample demonstrates multiple skill sets including team leadership, operations, guest experience enhancement, etc. For the Shipping Operations resume example, here is the profile of Stanley Morris, who is 20+ years experienced General Manager. 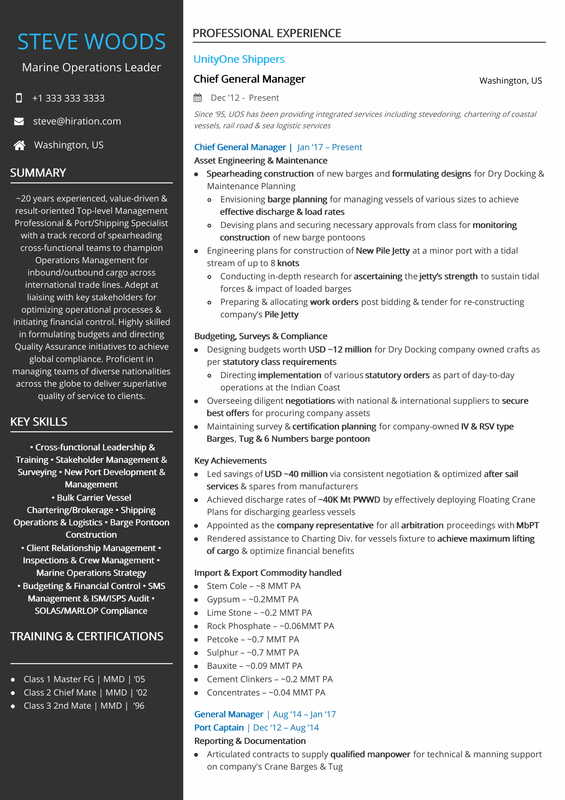 This Shipping Operations Leader resume sample demonstrates multiple skill sets including negotiation, P&L management, client relations, etc. For the GM - Malls resume sample, here is the profile of Vienna Colorado, who is 12+ years experienced Acting Leasing Director. 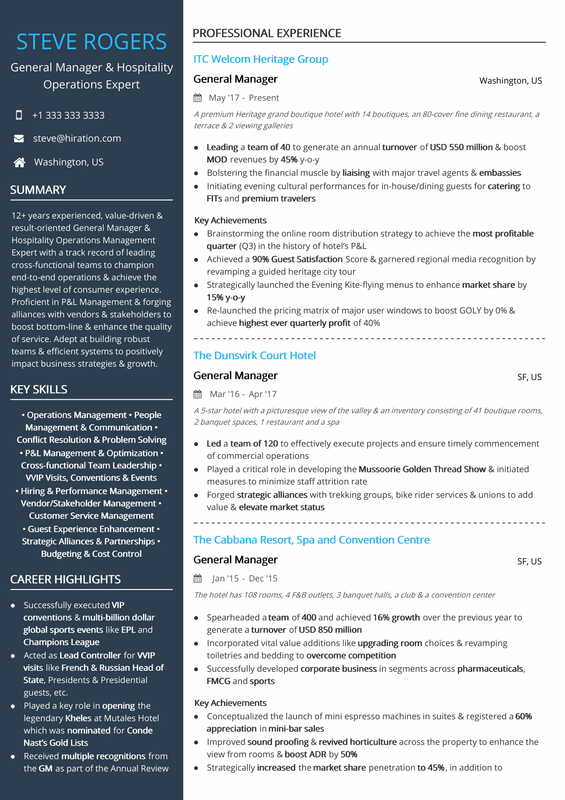 This GM - Malls resume sample demonstrates multiple skill sets including mall operations, client relationship management, lead generation, etc. 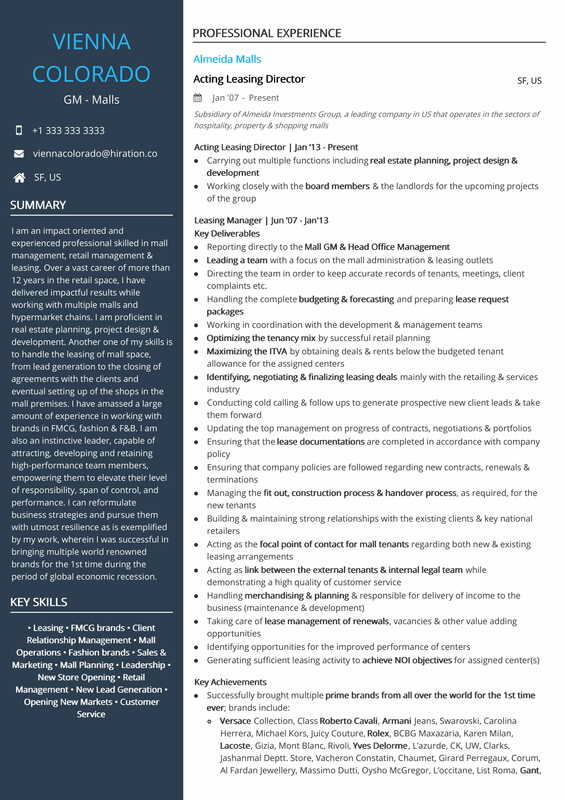 For the Operations Planning Expert resume example, here is the profile of Noah Archer, a 13+ years experienced Control Leader & Operations Planning Specialist. 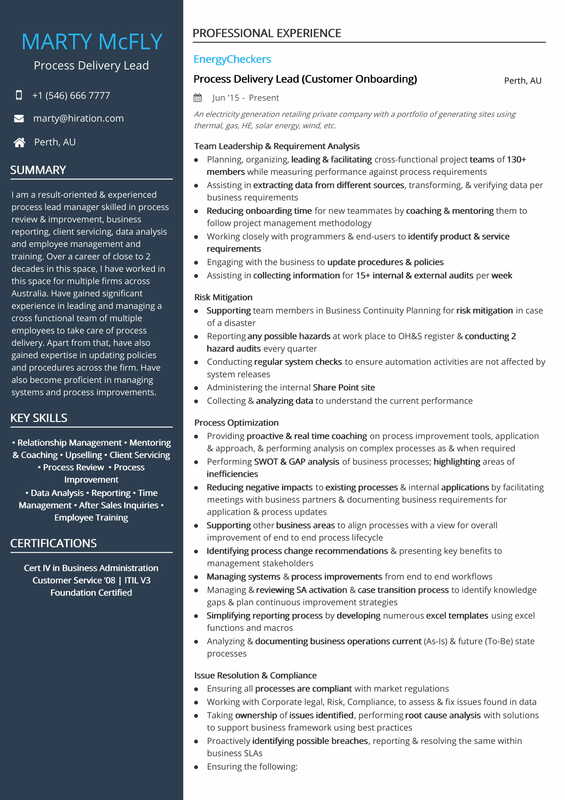 This Data Scientist resume sample demonstrates multiple skill sets including business intelligence, production & process planning, etc.